A slim and discreet pad designed for light incontinence featuring an absorbent core. 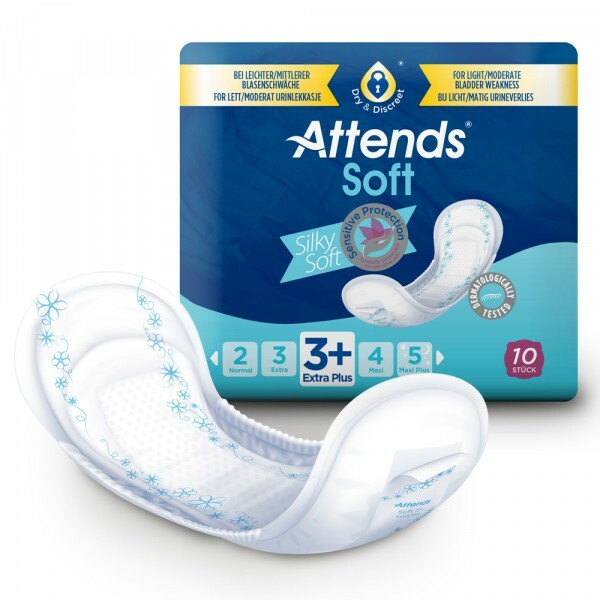 The Attends Soft 3 Extra are pads with a higher absorbency for light urinary incontinence. They are designed for urinary incontinence and have a slender design to fit discreetly into stretchy underpants. This is a cost-effective solution for people who don’t have a large budget for personal care, but who have an active lifestyle where they need to protect against bladder leakage. 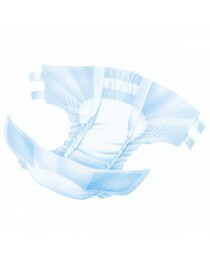 The Attends Soft pads are made from soft white material with blue starred design. They have a U-shaped design that conforms to the natural shape of the body. They are made with a slim and discreet design so that no one will be able to tell that they’re being worn under pants or trousers. The U-shaped design of the Attends Soft helps to trap fluids inside. There are three core levels, one for extra-absorbency, a surrounding layer just in case fluids escape the main layer, and a gathered final third layer to keep fluids inside there. All Attends pads and products have special odour protection to reduce embarrassment. This is ideal for when a patient is busy at an activity, and can be confident their pad will absorb all leaks and retain all smells, until they can visit a washroom. The Attends have an absorbent core that helps to trap fluids inside. They keep moisture away from the skin so its stays dry. There is a breathable textile backing to help keep skin comfortable and free of irritation. This will also help to maintain the health of the skin and prevent skin infections by decreasing the growth of bacteria after it’s exposed to skin or air. The Attends Soft is a line of pads that are anatomically shaped to be worn discreetly under underwear and clothing. The fibres are soft, so the wearer will forget that they are wearing them, and think they are regular underwear fabric. It provides an additional level of confidence who people who suffer incontinence issues to be able to complete their activities before heading to a washroom. One pack of Attends Soft 3 Extra contain 10 units. Each measures in a length of 32.5cm, with a front width of 12cm. They have an absorption range of 599ml. There are different Attends that have different absorbencies, so carefully select one that is right for the patient. • Easy to insert and remove. • Soft fibres for comfort. • Suitable for mild incontinence.